Help your friends and neighbors find the help they need to recover from fire, flood, mold infestation and other unfortunate events. Review Abbotts Fire and Flood Restoration on Google, Yelp, or the BBB. It’s easy, and your reviews help others find service they can trust. Click the Google icon. You will land on the Abbotts Fire and Flood Restoration Review Page In Google. 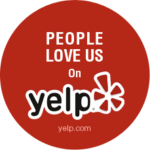 Click the Yelp icon. You will land on the Abbotts Fire and Flood Restoration page in Yelp. To the right, you will see a big red button labeled “Write a Review.” Click the button to open a brief form. A box will open with five stars across the top and a field in which you can write comments. Click the number of stars you wish to award to Abbotts Fire and Flood Restoration (5, we hope) and tell a little of your story if you wish—what your problem was, how Abbotts helped. When you’re ready, click the button labeled “Sign Up and Post” at the bottom of the form. You will be prompted to either sign in with your existing Yelp profile, use your Facebook login or set up a Yelp profile (takes about 1 minute). Follow the prompts to sign in and submit your review, and you’ll help others find quality services they need. Click the Facebook icon. You will land on the Abbotts Fire and Flood Restoration page in Facebook. In the page feed you will see a box with five stars across the top and a field in which you can write comments. Click the number of stars you wish to award to Abbotts Fire and Flood Restoration (5, we hope) and tell a little of your story if you wish, what your problem was and how Abbotts helped. When you’re ready, click the “Done” button at the bottom of the box. When you click the BBB icon above, you will land on the BBB’s review submission page for Abbotts Fire and Flood. Complete the form and click “Submit” to provide your review.